Chemical Bank Clare supports the city of Clare and revitalization of the downtown area through $10,000 in donations over a two year period to the Clare Rail Depot Project. 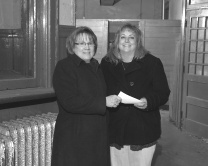 Several significant donations have been made to support this project which will significantly enhance the downtown area. The Clare County Arts Council, the Clare Irish Festival Committee and A.J. & Sandy Doherty have also made notable contributions. The proposed plan includes moving the Depot to the land on Fourth Street across from ClareCastle Senior Living. The three vacant buildings that are currently there will be demolished. Once moved, the Depot will be renovated to serve in a multi-use capacity including a Welcome Center, the Rail Trail trailhead and railroad museum. Mid Michigan Community Action is partnering with the City of Clare on the project and will contribute a portion of the land. Clare looks forward to the restored depot as it promises to add significant historical and cultural presence to the downtown area as well as serving the community in a multi-use capacity. Tax deductible donations can be made to Mid Michigan Community Action PO Box 768, Farwell, MI 48622. Please make sure it is noted to the “Clare Depot Project.” A link on MMCAA’s website, www.mmcaa.org, will be available soon so that donations can be made online. The depot was built by the Ann Arbor and Pere Marquette railroad companies in 1898.